1001 TRICKS IN 1 HOUR!!! SPRING BREAK! PLENTY OF FREE PARKING! ALL shows are especially TODDLER FRIENDLY so bring those fidgety kids-they ALWAYS love the show and are RIVETED to the ACTION anyway. “I couldn’t believe they paid attention through the whole hour,“ is a regular comment made by astounded parents. Arrive 15 minutes early to claim your seats as we release tickets to the Stand By Line 5 minutes before the show. And we start on time! Pre-show live music for early arrivals! Tons of Dog tricks (with FIVE Rescued Dogs), Puppets, Giant Bubbles, a Scarlet Macaw, Juggling, Unicycling, Circus Balancing Acts, and LOTS MORE!!!! 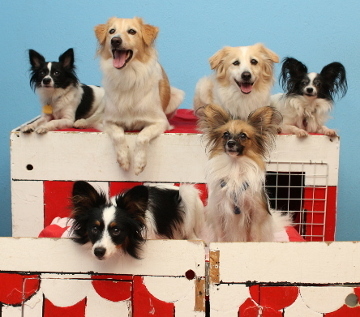 Follow the dogs on their journey as they search for the secret to finding their forever home. 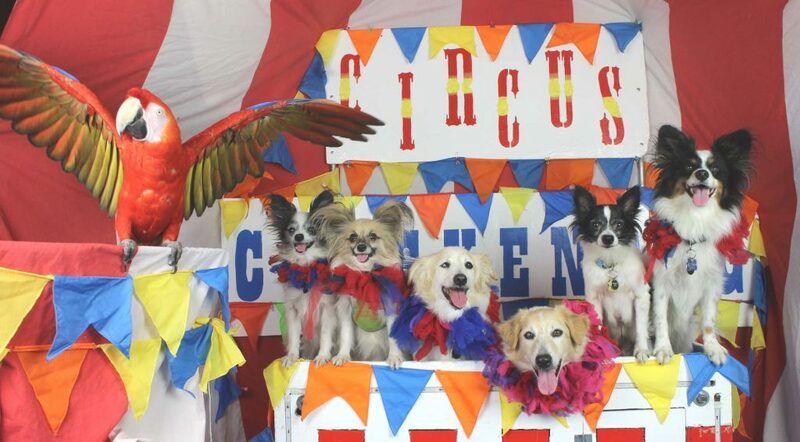 Somehow they always do something to keep from getting adopted so they can stay with their favorite human, Darren, Owner of Circus Chickendog’s Rehabilitation Home for Wayward Dogs. Watch as Darren never realizes that the dogs just don’t want to leave the circus! Sign up for our Newsletter for Back Stage Offers!All in 55 minutes to keep even a toddler enthralled!! !Bring the whole family to enjoy this fabulous show together!Don’t Delay! Limited Seating!!! Sure, they look happy now, but wait until the puppies get in trouble and wind up in Time Out.